One of those forgotten edibles, a watermelon, is catching the attention of chefs, farmers and food adventurists such as us! This isn’t just any watermelon, though. This particular treasure also holds Nat’s family name, the Bradford Watermelon — and it’s history is nothing short of spectacular (and at times it seems unreal)! However crazy the history may seem, it’s the real deal and Nat is very proud of it, as he should be. Nat found reference to a “Bradford Watermelon” from South Carolina in an old book from the 1850’s. The book described his family’s watermelon exactly as Nat knew it. However, the story ended there and Nat still had questions in need of answers. Nat did do some searching and found a man named David Shields, a professor at the University of South Carolina. Professor Shields had a website called American Heritage Vegetables, and an email correspondence from Nat and Prof. Shields would soon uncover some of the mystery behind this fruit’s story. Nat found that the watermelon cited in the old book was in fact the same variety that he’d been eating since he was a young boy. Turns out it was Nat’s sixth Great Grandfather, Nathaniel Bradford, who was responsible for breeding this watermelon. For 170 years the Bradford family watermelon was kept under wraps and for a hundred years it was thought that the watermelon was lost for good. 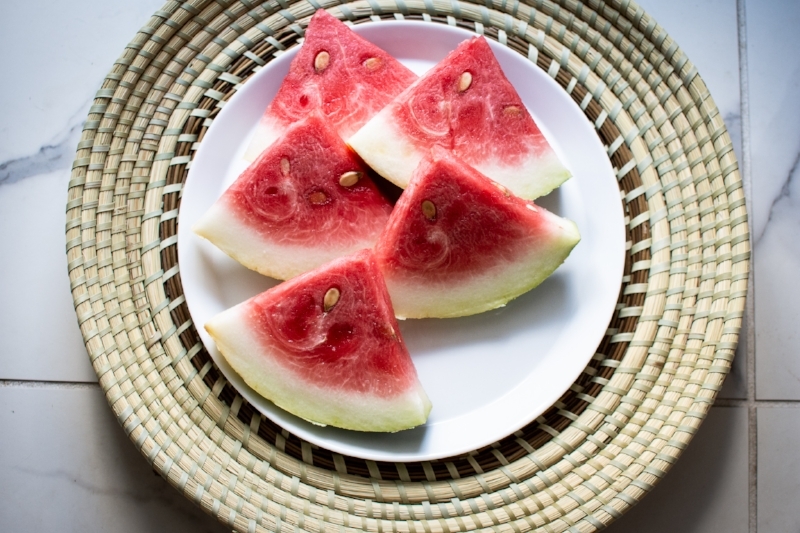 The Bradford watermelon is known for its wonderful sweetness, tender rind and white seeds. If you’re wondering why you haven’t found this gem while you’re out and about, that’s partly because of the fragile skin that makes it difficult to transport commercially. This is also why conventionally grown watermelon doesn’t make the cut — they’ve been bred for a tough outer skin in order to reduce waste, which has also reduced the flavor. The Bradford melon doesn’t have that issue, and we can promise you that from our own tasting experience. It doesn’t matter if you enjoy a slice of cold watermelon on its own, or if you’re someone that likes a small pinch of salt, this historic watermelon has reset the bar and it is high. Every year Nat takes orders before the watermelon harvest, so if you’re local you’ll have to get on the list as soon as possible. Nat also provides his watermelons to local area restaurants, breweries and distilleries. Yup! You heard right, breweries and distilleries. He’s done collaborations with Carolina Bauernhaus, a brewery in Anderson, SC and with Edmund’s Oast Brewery in Charleston, SC. Nat also has Watermelon Brandy that is offered through his website, distilled by Six & Twenty Distillery in Powdersville, SC. You can also enjoy the Bradford Watermelon all year with Bradford rind pickles and Watermelon Molasses, both available through Nat’s online store, here. Be sure to follow the Bradford Family through Nat’s website and on Instagram @bradford_watermelons. This cool video below was created by PBS for the show The Mind of a Chef, and gives you the crazy history behind the famous Bradford Watermelon — definitely check it out!